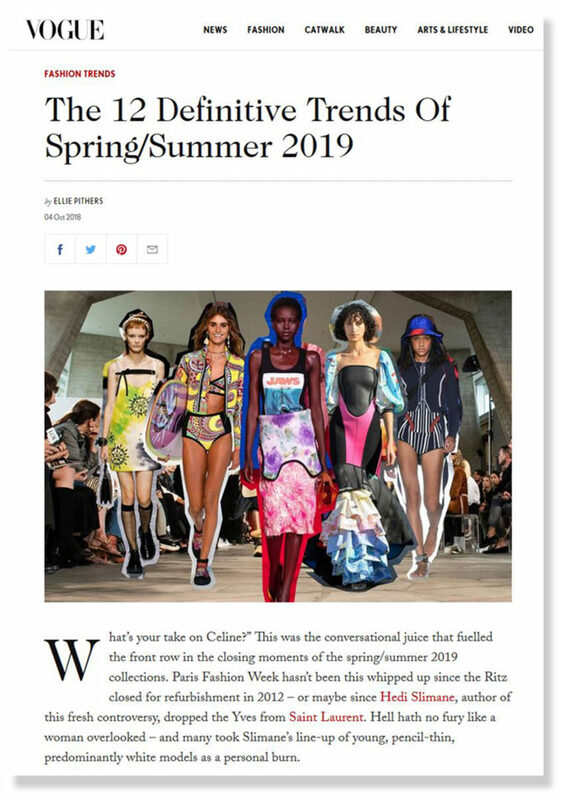 Here are the spring/summer 2019 trends as identified by Vogue. Vogue is predicting that shades of beige, tie dye, neoprene, streetwear-inspired and menswear-inspired lace, macrame, loads of trim (feathers! ), florals and busy prints, and brilliant colors will be popular this spring. What do you think? What’s your feeling about fashion trends? Do you eagerly watch to see what’s new in the fashion world, or is all of that “fashion stuff” meaningless to you? After all, what we see on the runways is often so over-the-top, it doesn’t really seem relevant to what most of us wear. If you do follow the trends, do you put them to use in your own sewing and wardrobe planning, or is it all just sort of fun to see what’s happening even though none of it seems to apply to real life very much? You’ve probably noticed that every city or geographic location has its own sartorial identity, whether intentional or not. I grew up in Madison, Wisconsin, where eight months of the year we were just trying to stay warm in the frigid cold and our fashion choices were down parkas and balaclavas, for the most part. (Witness last week and all the frigid weather!) Summer mostly consisted of T-shirts and jeans or shorts. Even though I’ve always had a strong interest in fashion, I went away to college and discovered that my peers were dressing in a much more preppy style than I was. I felt out of place. I felt out of place again when I graduated and moved to New York, where I couldn’t really afford a proper wardrobe for my new corporate career. In fact, I suspect that much of my interest in fashion, all these years, has stemmed from a desire to never feel out of place and to always have a basic wardrobe that can take me anyplace while feeling well-dressed, or at least appropriately dressed. I don’t want to have a lot of clothing, I just want to have the right clothes to express my personality and make me look presentable/fashionable. I also don’t want to replace my entire wardrobe every year. I don’t want to waste money, time, or resources on clothing that I’ll give away or throw away after a year. That’s why a core wardrobe is great for me. I don’t have a lot of space, nor do I want to own a lot of things. But I want my clothing to offer me enough options that I’ll never feel like I have nothing to wear or feel inappropriately or unfashionably dress. I guess that’s why I’ve always been drawn to the concept of the core wardrobe. Here’s another thought, semi-related but which I’ll connect shortly. When we moved from New York to Madrid three years ago I was a bit surprised by the women’s style here. If there is one thing I really appreciate about New York (and Paris as well) it’s that stylish women really know how to find their own style and stick to it. Speaking in a general way, they use fashion to enhance their personalities. They don’t follow trends or fashion directions blindly. New York women understand fashion and the messages it conveys, and they dress according to what they want to say about themselves rather than what is trendy. 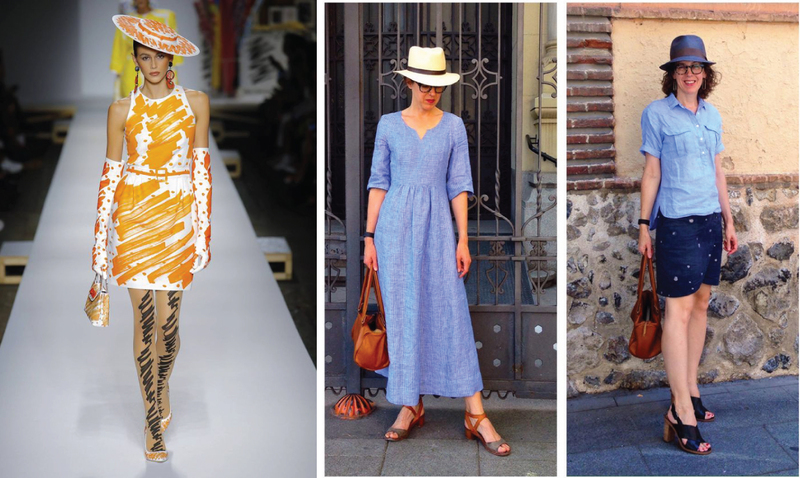 I was a little disappointed to find that “stylish” women in Madrid follow trends quite literally, allowing fashion to dictate how they dress rather than adopting fashion for their own needs. Every day they might dress entirely different, without seeming to know their own style at all. So to bring this all back to trends and my own personal feeling about them, I’d say I have more of a New Yorker’s attitude toward trends. I know what looks good on me and what suits my personality. I prefer a tailored but feminine silhouette: my wardrobe basics are blazers, button-down shirts, pencil skirts, sleek trousers (straight- or wide-leg), and fitted cashmere sweaters. In summer I loosen up a bit (who can wear layers when it’s 100 degrees outside?) and prefer button-down shirts and skirts. (The City Stroll Wrap Skirt is an summer essential for me). So when it comes to trends, I have two criteria that help me to determine whether I’m on board with something that’s trending. First, does it suit my style? For example, I know I just can’t wear skinny jeans so I’ve never bought them even though they’ve been on trend for quite a few years now. But if straight-legged jeans are trending I might purchase a pair or two since I know they’re a good style for me and I’ll wear them for a long time, no matter what everyone else is wearing. Here’s my second trend requirement, and I proceed to this step only if I answer yes to the first question: Is this a trend that’s here to stay or is it fleeting? For example, is vinyl trending? I’ll pass. Vinyl probably isn’t going to stick around for a long time. It comes and goes quickly. The same with trends like fur-lined Birkenstocks. Fun now, silly in six months. As a result, if you wear your furry sandals next year you’ll feel very out of fashion because everyone else has moved on. In my opinion, why waste your money on something that’s so fleeting, no matter what the price? So here’s another, more practical way to follow trends so they work for you. According to Vogue, beige is a spring/summer 2019 trend. I would agree; when I was in New York last summer I noticed a lot of khaki and soft cream colors being worn. Designers often take trends to an extreme, so many of them showed a full beige outfit on the runway. (Oh my word, so much beige right now!) But last summer most New Yorkers were mixing their neutrals with other neutrals and soft pastels, which makes the whole trend much more wearable. This way you can wear a trend (in this case, neutrals) but wear it in a way that isn’t so extreme while also expressing your own personality rather than that of a designer. 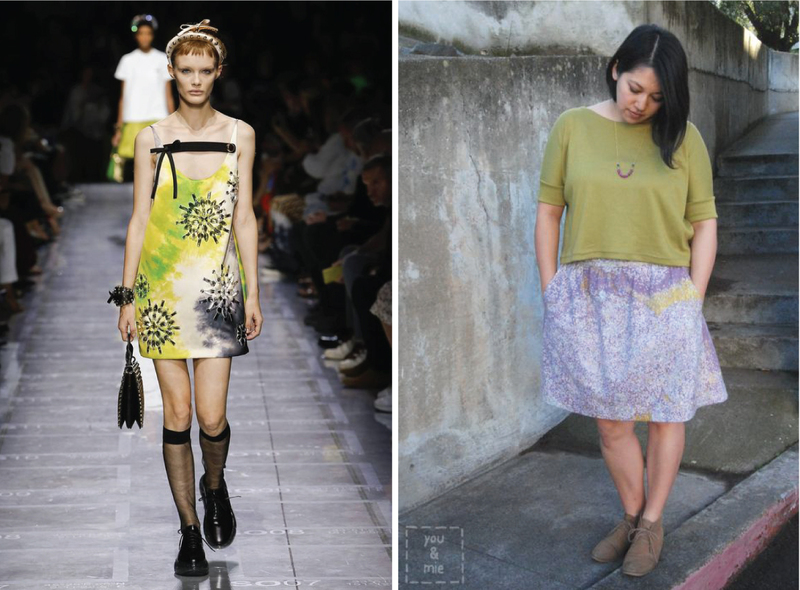 Here’s another example: Vogue proclaimed a spring trend for tie dye. I haven’t worn tie dye since college, and it doesn’t fit my personal style at all. But I do love a watercolor floral or soft watercolor abstract print, and I’d be more likely to embrace the trend through a watercolor printed top or summer dress, which acknowledges the tie dye direction without fully embracing it. I love Nani Iro watercolor prints, so I might embrace her fabrics as a way of acknowledging the trend without fully embracing it. Vogue’s Craft Work trend: Quite a few designers embraced patchwork in recent seasons, and now the direction seems to be more toward macrame. This seems pretty short-lived to me. I love macrame, but to wear? I’ll pass. But a little fringe trim on something I sew? Sure! Hats: I adore a good hat. Nothing crazy, of course. In my preference for tailored styles I love a good fedora, and I almost don’t leave the house during the summer without one. However, no matter what the style you probably won’t find me in anything feminine or frilly. No veils, no ruffles, not even to a royal wedding. They’re just not me. Pass, but I’ll keep wearing my own hats. So what about you? 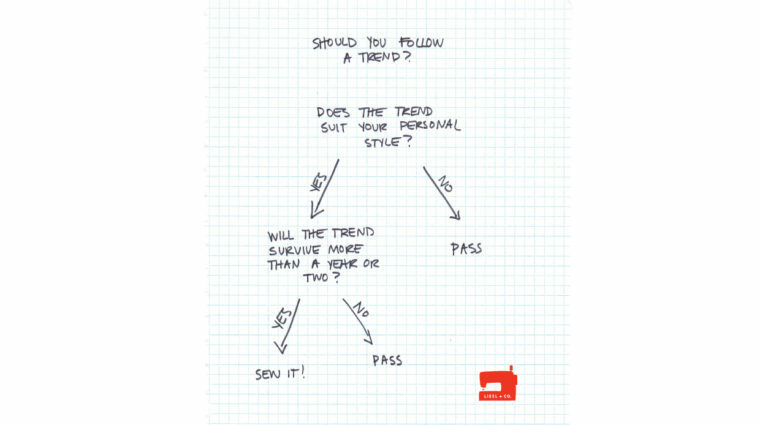 How do you approach trends? Do you know your personal style and what you prefer? Are you trying to decide what your style is? What trends are you embracing this spring, if any? This was a great article! I love the runway vs real life idea. I am often bewildered by the ‘top 12 fashion trends for spring’. I’m nearly 60 and while I want to be fashionable, I’m not always sure how to interpret the trends for myself in a way that’s tasteful and not silly. I’m kind of new back to sewing and so a whole big world of choice has opened up since I’m not held hostage by what’s in the stores. This is good, but it’s also overwhelming at times! I’d love more articles like this with suggestions of what to sew and what kind of fabrics to use. Your pattern lines have so many great basics, so some guidance on how to use fabric, trim, color, accessories to reflect trends with those basics would be super helpful. Well how about that! I joined the Oliver and S group but how did I not know there was a Liesl group? Just ran over and joined! I have found your patterns to be so so great I need to post because I have made a ton of things. I’m hoping to do a Bistro Dress next! You’re lucky you can! My muscular legs just look all wrong in them. Thanks for commenting! I didn’t know you lived in Madison! Moving there from San Diego for grad school was a huge shock to me! I love trends that align with my color/style preferences and totally skip over the ones that aren’t me. I will definitely be skipping most of these (especially beige since I don’t love it). I love your core wardrobe and your sense of style! This is a great post! I admit that I read some fashion trend articles, and I at least skim over a few reviews in major newspapers of runway seasons. I am interested to know how clothing can express a mood or theme of the times — sartorial expression by several designers over one season or one designer over several seasons. I hardly follow the trends myself, though! Or, I do it in a much more watered down way. I’ve embraced the sneaker trend, except I can’t get myself to wear the overly flamboyant, platform-sole, designer label encrusted sneakers and marvel when I actually see people wearing them… but in the summer I will happily wear a simple “streetwear” (non-athletic) sneaker with a skirt, dress, or slacks. I wouldn’t have done this 5-10 years ago, so it is “trendy” to me. And, much to the eyeroll of my husband, I have been wearing the same pair of clog booties in the shoulder seasons for maybe 7 years, but it was only from you that I learned that it is in the zeitgeist of NYC! My stilettos haven’t seen the light of day in a long while, now. I know that some proportions of clothes just don’t work for my body type (which has changed every decade of my life), so as much as I can admire a look on someone else, I might not be able to pull it off myself. I’m a big fan of a seasonal core wardrobe that works almost like a personal uniform and working in tiny bits of personal expression in small doses. This feel practical and stylish to me. I love your comment, Erica. You’ve totally nailed the whole trend thing. Yes, it filters down into our lives one way or another. But you understand how much of it applies to you and when to embrace it and when to leave it alone. Bravo! I’m always intrigued by how trends filter down into everyday wear, though I certainly tend to stick with my uniform and rarely adopt trends (usually only when they’ve lasted 5+ years and are on their way out, lol). 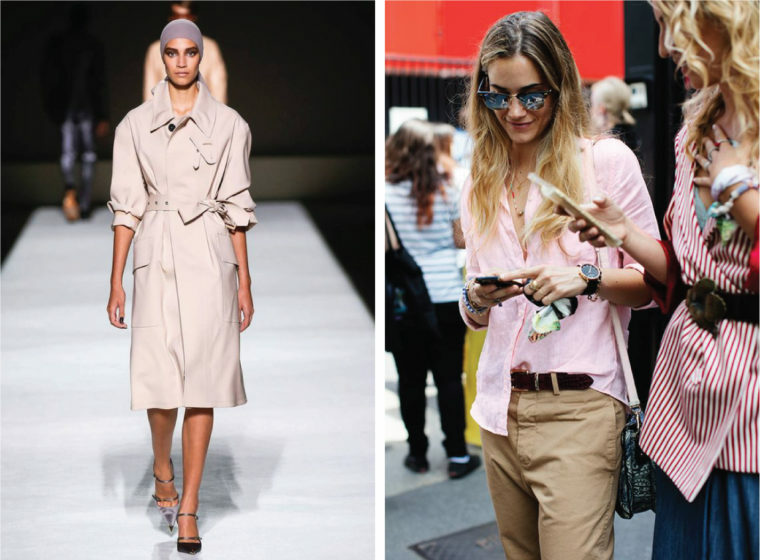 I will say that I could totally get on board a beige trench/safari dress! Thank you Liesl. I love reading how other people interpret catwalk trends for real life – a process that sometimes mystifies me. I love browsing the fashion magazines, but it’s rare that I spot anything I want to wear straight off the page. I see a difference between fads and trends. I’m amazed at how some go on so long despite how poorly they look on most people (leggings, skinny jeans, odd colors). 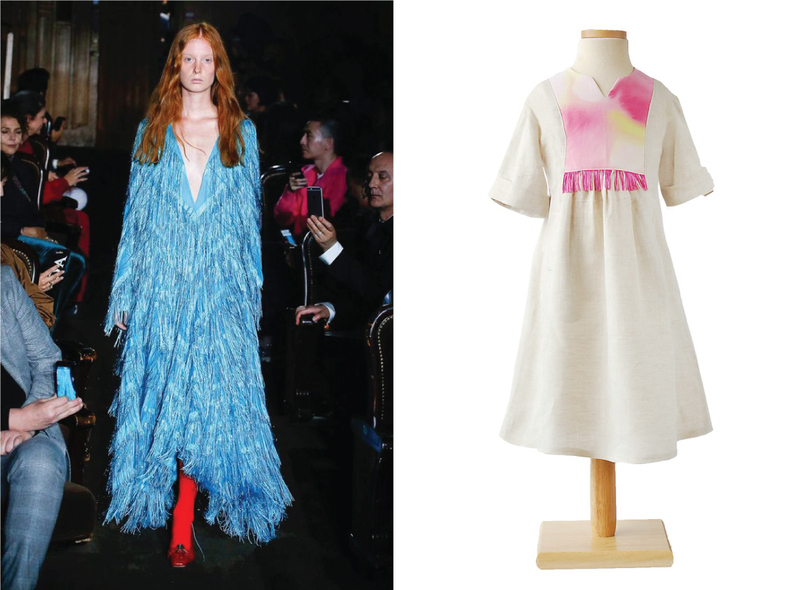 I think the runway shows do have influence since the details are picked up by ready to wear. I’m so glad I sew. I can adapt trends and use my basic patterns that fit well and have the silhouette that looks best. For instance I don’t look good in narrow leg pants. I feel like an ice cream cone. Narrow leg pants are all you can find in stores so I sew my own. I’m so happy to see your new pants pattern. I hope this points the way to a new shape for all. They look so elegant. So interesting, Liesl. I mostly keep half an eye on trends so that I don’t buy something that turns out to be really fashionable, and then quickly looks out-of-date. This structured way of evaluating and then interpreting trends is much more positive, and useful. I shall try to apply it in future! Love the runway/real life illustrations. I don’t really follow trends, in that I don’t tend to read about them or watch runway shows (because, like you said, they feel totally unrelateable to me). I’m probably influenced by trends the most through seeing what people are making/wearing on IG. Some stick, and some don’t. For example, I never understood the cold shoulder trend (actually, that’s being charitable – I kind of loathed it). But after resisting skinny jeans for easily 10 years, I finally started wearing and sewing them. Now I love them. Maybe they wore me down? I have no idea. Colors tend to catch my eye the most through my IG perusal and blog reading, though I’m always a good 2+ years behind the Pantone color of the year – I started to like pale pink last year (it was color of the year in 2016) and emerald green the year before (it held the title in 2013). Oh I’m so with you on the cold shoulder thing. It was always going to date and would look like last season’s outfit very quickly. I rode out the muffin top jeans phase too, and simply didn’t buy new jeans for almost ten years. Thank goodness well made clothes last, my old high waisted jeans kept going until they were back in style! This was my first thought, too, the cold shoulder thing. I don’t understand the popularity at all. Regarding shoes, I bought a pair of cute camel driving shoes with the bit detail this winter that I love. I live in ballet flats in warmer months, but they don’t really translate so well to socks and tights, but I don’t always want the bulk of a boot. I sort of gravitate to flat options for shoes since I have back problems, but I figure if French women can live in flats, so can I.
I stick mostly to the classics…clean lines, tailored and timeless – and I also stick to a seasonal color palette (spring). I’ll add a pop of color or fun in an accessory – but I always get “stuck” on which shoes to wear with what outfits. I’m a “young at heart” grandmother so I won’t be copying much younger women in this department. I still love a classic pump with dressier outfits…and summer is easy as I live in casual sandals.I would love an article on shoes – which style/height heel to wear with what hemline, etc. Love you blog and patterns…thanks so much for sharing! Unlike so many here, I have no idea what my personal style is and hardly understand what that even means. let alone how to identify it! I’m 65 and retired so mostly casual – I grew up in the 60s about 45 minutes from Mad City so “casual” comes naturally. Now I live in Texas, where it’s too hot to even think about layering at least six months of the year – it’s shorts, t-shirt and sandals, day after day. Having recently returned to sewing after a 45-year break, I’m re-learning to sew for a dramatically-different body, and feel lost when trying to select the pattern and fabric that will feel like “me,” will fit and will be flattering, too! Are there resources you can recommend to help me pin down my “personal style”? Thank you in advance! I, too, am getting back to sewing for myself in my fifties. I am thoroughly enjoying it. I get a lot of inspiration from your blog, Liesl! I so much agree with what you have said in this blog. Fashion trends scare me off and I am finally getting comfortable in my choices of what I like, rather than what is the height of fashion. I like what you said that fashion should be a reflection of the wearer, rather than fashion wearing the person! Please keep up with these thought provoking articles. Oh my – I feel as if I’ve found my style twin in you. Your comments about your personal style are spot on with how I like to dress. Perhaps that is why I have been so drawn to your patterns. I do like how you have shown how to transcend what’s happening on the runway to one’s own personal style. I had given up on trying to make sense of what goes on in fashion magazines but this has certainly helped. Thank you. What a great article! You ask lots of great questions too. I grew up in Italy. As a teenager I loved looking at fashion magazines but I found the outfits over the top and never understood how they related to the clothes sold in shops for everyday wear. As a student in the UK I witnessed the explosion of fast fashion but I only followed a trend if it suited my style. Now as a mother I live in the Caribbean and my style has changed again to adapt to the hot temperatures and the bright colours. I still love to see what others wear (and make) as everyday wear. 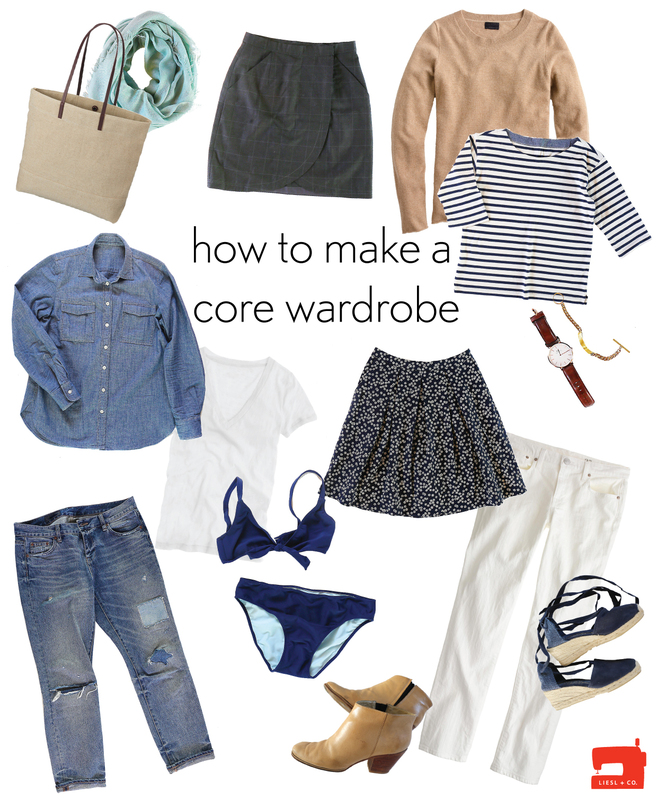 I love the concept of a core wardrobe and would be really interested in more posts on this. As I have adapted my style and reduced my wardrobe I am also working towards a core wardrobe. It really helps me to plan my making and my shopping. I’m not aware of following fashion trends but by definition my shopping is limited to the current trends. I do ask does it suit my style but I also ask: Does it fill a gap in my core wardrobe? Does it suit my colour pallette? Is it made of natural fibres? Where is it made? How much does it cost? Can I make it?! I have a good sense of my personal style and what I prefer but I like to think of it as a work in progress. When I travel and have the opportunity to shop I like to try new styles. Second hand clothes are great for this! I would love to read more posts on finding a personal style. Thank you! Yes to tie dye if it’s indigo. I just made a beach cover up that I love. I also saved a cotton blouse on which the black embroidery ran. Black silk thread from DMC, wonderful to stitch with, but totally ran like a wildebeest. So my little white blouse is now indigo. The embroidery is more difficult to see, but after all that sewing, I was as glad to still be able to wear it. No to beige, except linen pants. I’m a palazzo pant woman. Yeah, fashion over 60 is fraught with pitfalls. No more dresses or skirts above the knee. Capris instead do shorts. Flats and kitten heels instead of stilettos. Good fit is the new runway fashion for me. If it fits, then I’m comfortable. If I feel comfortable, then I’m confident. Now that’s haute couture. Natural fibers are a must. Cotton jeans, sans holes and a long sleeve merino T-shirt layered with a wool jacket or sweater is a winter favorite. All the other seasons here are linen weather. Once I get the fit sorted on my classic shirt, it will become my summer jacket. Wash, wear, repeat, that’s my fashion mantra. Glad to hear about the new size range. Please don’t forget that many of us are not 6 feet tall. I don’t care what you call it, if I can get a good fit. At 60, bust darts are never in the right place. Please consider soft pleats/rutching in an upcoming design.